We went out to Whidbey Island, taking the ferry from Mukilteo. 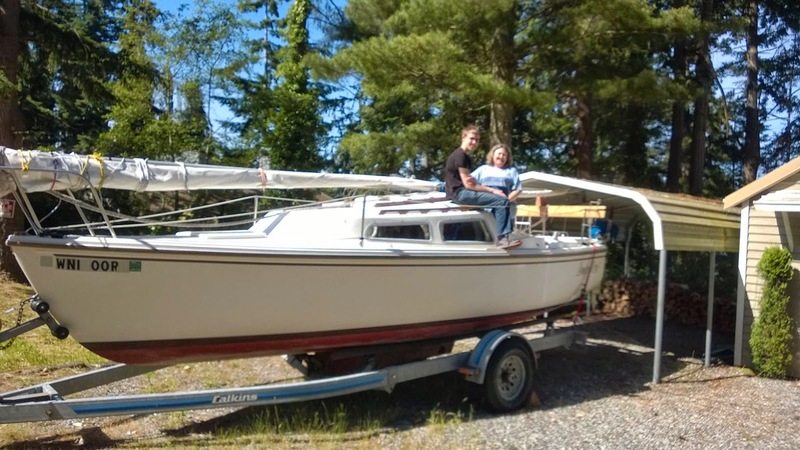 We left being the proud owners of a fine Catalina 22. At the time, our vehicle didn't have a trailer hitch, so we couldn't bring her back with us. We arrange for a friend to bring her home for us. An emergency kit, with flares, etc. Manuals for the boat itself, the motor, the furling jib, the VHF radio, etc. We went immediately to the Department of Licensing place to register it. Although we had the title for the boat, we discovered that we didn't get the title for the trailer. The reason was that it had just been re-issued to the previous owner and was still in the mail. He sent it a few days later and we applied for the title after we received it. We had done our research on the value of the boat, the trailer, and the other stuff. We had prepared three separate bills of sale: one for the boat, one for the trailer, one for all the other stuff including the outboard. There can be beneficial tax reasons for structuring it like this.